She appeared in The Princess and the Togepi and A Togepi Mirage. After noticing the blimp piloted by Team Rocket landing, she found Misty's Togepi injured in the fountain at the palace garden. Her parents and the caretaker, Miranda thought the Togepi was hers, but they realized the Togepi belonged to Misty and that Colonel Hansen stole Togepi from her after they meet Ash and his friends. Sara knew the Togepi belonged to Misty. 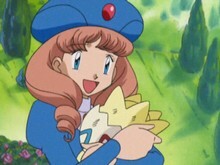 After Togepi was stolen again by Hansen, and after Hansen sent her parents to the dungeon, Ash and company helped her stop Hansen, because she vowed never to let an impure-hearted person rule the Mirage Kingdom, because if said kingdom was ruled by someone with an impure heart, this would destroy the Togepi Paradise. After Hansen got arrested, she found the Togepi of Legend.